Hoàng triều Ngự tửu (Imperial Wine) is the name of a medicinal wine in Hue Imperial City. 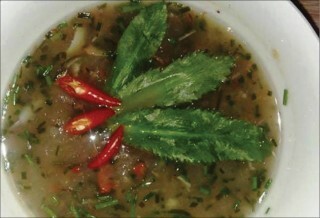 The unique value of this medicinal wine is the strong taste of Chuon village’s wine made from brown rice, soaked with Minh Mang Medical Prescription. This is the only prescription collected so far that has the red seal of the Royal Medical Academy of the Nguyen Dynasty, distinguished from versions of Minh Mang Medical Prescription circulating amongst common people. 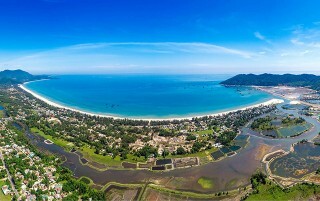 Chuon Village is the Nom (Sino-Vietnamese language) name of An Truyen village, an ancient village over 600 years old, located along Tam Giang lagoon, in Phu An commune, Phu Vang district. 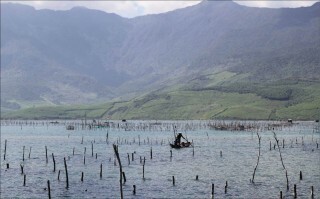 Surrounded by Tam Giang lagoon, the source of water and soil of An Truyen is the origin of many typical products, including the famous Chuon rice wine. 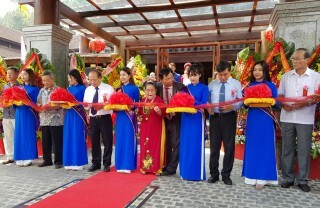 Mr. Nguyen Mot, also known by Nguyen Tien Dung, the owner of Dam Chuon Hoi Quan Restaurant, is proud of the delicious wine, imbued with the village lagoon's taste. Mr. Mot says that he is not well educated, but he can make other people surprised at his boundless pride of Chuon Village’s wine, the product that his village's people have distilled through many generations. Chuon Village’s wine is special because the rice used for manufacturing is a kind of red brown rice filled with bran grown in the village's brackish water field. Each batch of wine is stored in traditional copper kegs and must be cooked with firewood or rice husk. The water used for distillation must also be taken from the village's source. Through Dam Chuon Hoi Quan Restaurant, he and his wife not only maintain their livelihood from the fish, shrimp, crabs of this brackish water, but they also connect, share and show off to faraway guests the taste of Chuon Village’s rice wine. These guests come from many places, from the South to the North and also from foreign countries. From Hanoi, particularly, many tourist groups arriving in An Truyen would be sad if the strong, rich and aromatic taste of Chuon Village’s wine was not available. So, the restaurant always stocks enough wine which Mr. Mot ordered himself from familiar distillers. 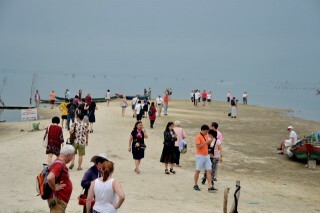 Among many tourists who have visited Dam Chuon Hoi Quan Restaurant, Nguyen Mot remembers the most a group of French tourists. That time, they brought a small bottle of wine, priced at about 6 million VND. The guests friendly invited the owner to taste their wine. Mr. Mot took a sip and then brought the rice wine from Chuon Village to share with them in return. Unexpectedly, after trying a round of the village wine, the group of guests gave the owner of their wine and only used rice wine for their fun event. "Seeing guests changing the wine, I know that my village’s wine is superior to that expensive bottle of imported wine. Only people who are "familiar" with alcohol can taste the "thickness" and the “strong and aromatic richness” which are permeated into every drop of the rice wine of Chuon Village. But the important thing to remember is that this is not a kind of wine for drunken drinking, but for moderate tasting and enjoyment,” Mot reminded. Not born and raised in An Truyen but Mr. Dang Van Thanh (originally from Thuy Thanh, Huong Thuy town) devotes his passion, time and money to develop the brand of rice wine in Chuon Village and Hoang trieu Ngu tuu. When he left school, Thanh also left Hue to find startup opportunities. 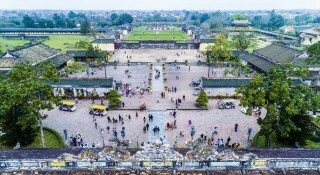 From his travels, Thanh has realized that the potential of Hue's cultural source is extremely big, but many legacies have not been fully exploited. 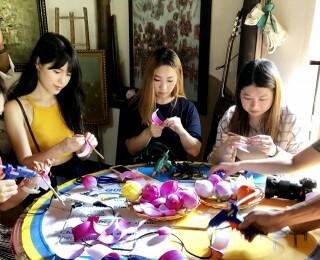 Chuon Village’s rice wine was the first traditional handicraft product that he chose to develop into a brand name when he returned to invest in Hue. From his investigation, he learned that under the Nguyen Dynasty, rice wine of Chuon village was one of the most famous wines offered to the king. 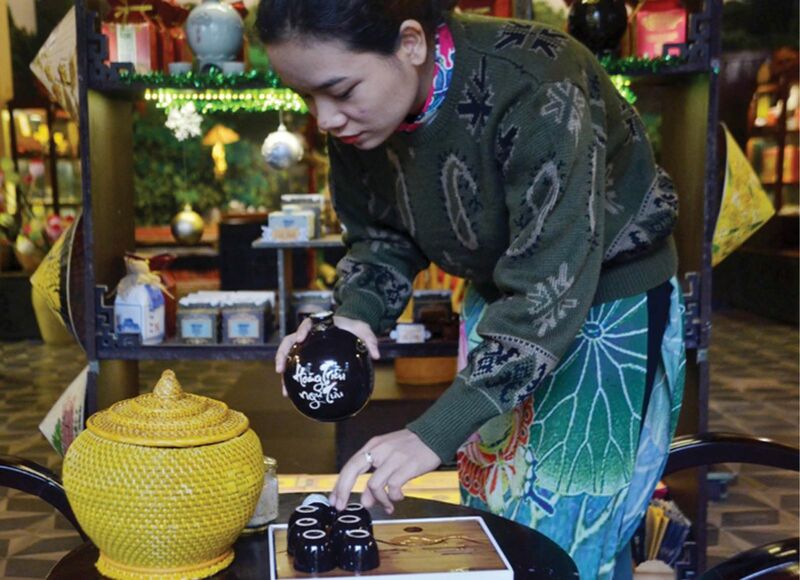 Thanh cooperated with Hue Center for Heritage Services Development (a part of Hue Monuments Conservation Center) to research and develop a line of royal wine products, including Hoang trieu Ngu tuu. Under the Nguyen Dynasty, the production and use of alcohol in the royal court was strictly controlled by the state, and alcohol was categorized into many different types. Among these types, Chuon Village’s wine is a wine selected by the Nguyen court. Good rice varieties were given to the villagers to plant, harvest and made wine which was then supplied to the palace, to serve the special occasions of the imperial court. In 2013, when Dang Van Thanh established Chuon Village’s Wine Joint Stock Company and later developed a line of wine products, there were many other products already on the market. 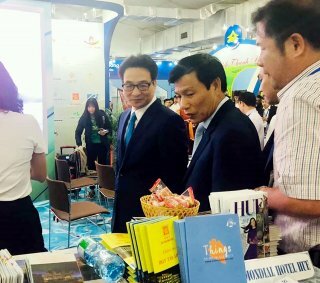 But he has faith in Hoang trieu Ngu tuu because the product has many differences compared to many brands of the same type in the market. 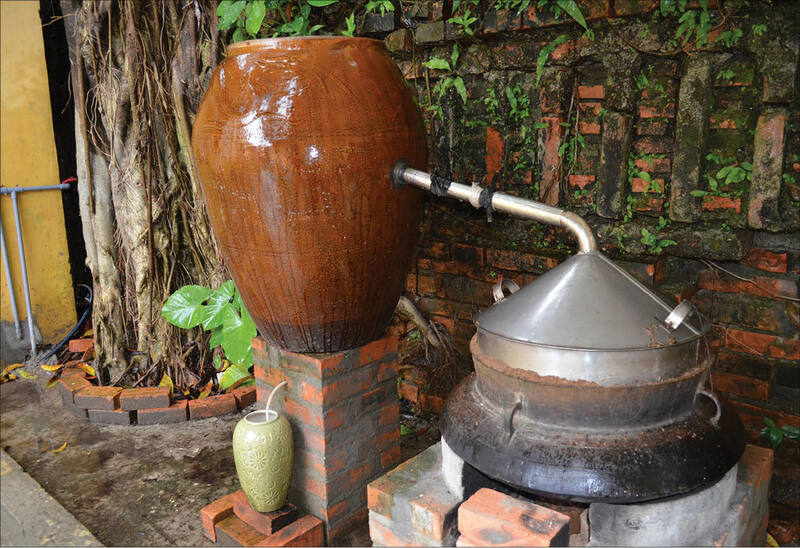 The source of alcohol is entirely made by Chuon villagers by traditional craftsmanship techniques, soaked with Minh Mang Medicine Prescription that was formulated by the Royal Medical Academy of the Nguyen Dynasty. It is not only a precious wine of quality, but also of the intangible cultural heritage value of this land. There are more than 20 versions of Minh Mang Medicine Prescription on the market. Fortunately, Dang Van Thanh has received help from an Elite Teacher and physician Phan Tan To (Vice Chairman of the provincial Oriental Medicine Association). So, he was able to get access to the Quy tỳ hoàn (good for kidney) prescription, which had been formulated by the Royal Medical Academy for Minh Mang King’s use, dated December 26, the 10th Minh Mang year (1829), certified by a red seal. Compared with the other Ming Mang Prescription versions in the folk, the Eastern Medicine Association of the province has determined that this version is the one that has a long traditional reputation. 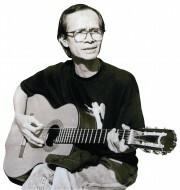 In developing Hoang trieu Ngu tuu, Dang Van Thanh was determined to comply with Minh Mang formula as much as possible. Thanks to the fact that he comes from a family with traditional medicine profession, for some ingredients (of animal origin) in prescriptions that have been banned from circulation, Thanh can actively find out the kind of alternative medicine that can be used; and the appropriate amount of use. When putting the word "Ngu" (King) into "Hoang trieu Ngu tuu", Thanh was well aware that this was a product ‘reserved for the king’. Both the content inside to the packaging outside cannot just be simple but need to be perfected so as to be ranked as a high-grade product. Therefore, not only does he focus on quality, but also formulate and invest heavily in the design. All of the packaging, from wooden boxes to the ceramic containers, are hand-made. Looking back on the past four years, Hoang trieu Ngu tuu is not yet a "goose laying golden eggs", but Thanh has an important motivation when his customers have good feedback. 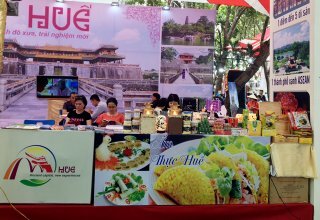 In addition to the Hue market, exclusively distributed by Hue Center for Heritage Services Development, Hoang trieu Ngu tuu has reached Da Nang, Hanoi and Ho Chi Minh City.